"Jam jars store jam, these jars store sunshine!" Captured inside the Sun and Moon Jars are a highly efficient solar cell, a rechargeable battery and a low energy LED. When the jar is placed in direct sunlight the solar cell creates an electrical current that charges the battery over a few hours. This energy is then used at night to power the LED lamp inside the jar. Aren't these Sun & Moon Jars Fun?! 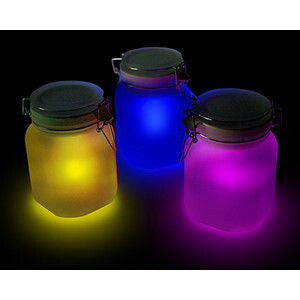 We received the jars in both the yellow & blue color options and both absolutely mesmarized B and the Princess! The princess took the yellow ( she thinks that there's a fairy in the jar :) and B took the Blue (hello! he's a Die hard METS fan...loves all things BLUE!) . The Sun & Moon Jars are super easy to operate. Simply open the jar upon arrival ad make sure that the internal switch is on, and place it in an area that gets lots of natural light during the day (which will charge the internal solar panel). The jars automatically turn on when the sun goes down. Because there is no external button, or solar panel and the jar is frosted concealing the bulb.....the kids think that they're magic! Simply run a standard extension cable into the bottom of the base, plug in all your power adapters, then snake the charging cables up through the grass. Voila! Your gadgets will think they're on a charging vacation. I have the biggest peeve! I truly dislike all of the chargers we have accumulated in our house! Cell Phone Chargers (one for DH's regular cell phone, work cell phone, my cell phone....UGH!) the cord to charge the video camera, the camera battery charger......it goes on and on.....and ON! 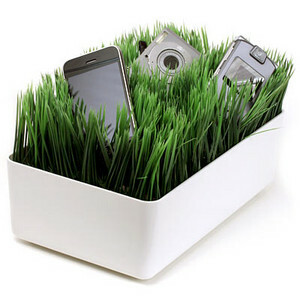 I found the perfect solution with the Grassy Lawn Charging Station! By simply running a cord to a power strip and plugging in all of my chargers (completely concealed under the "lawn" on the charging station), all I have to do is plug my devices in and let them hang out on the "Grassy Lawn" for a while, while they re-charge! A much more aesthetically pleasing alternative to all of the cords, I LOVE IT! These sophisticated stainless steel, travel style, mugs have our famous Caffeine molecule printed in black on the front. You must be thinking to yourselves right now 'your Caffeine molecule...'? Yep. Our Caffeine molecule. Here at ThinkGeek, we like to pretend we invented all the elements and hence we have first dibs on claiming ownership of any and all molecules derived from the use of our elements. I think Jen whipped up Carbon while playing around with a Rail Gun in Quake. And Jon just happened upon Nitrogen while abstracting some new Perl algorithms he was playing with while it was both raining and hailing outside. 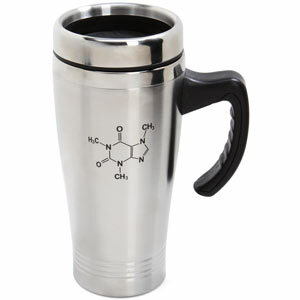 For the Coffee, Tea, or even Hot Chocolate fanatic, the Caffeine Molecule Stainless Steel Travel mug makes the perfect gift! I love this mug! Paired with a gift card to a favorite coffee or tea shop....or a bag of coffee or box of tea, it's PERFECT for Holiday Gift Giving! With an array of amazing Gifts and Novelty items (many exclusive to ThinkGeek).....I could browse through the ThinkGeek Site and Catalog for hours! I love it when great idea's are put into action; and ThinkGeek has all of those awesome one of kind item's that serve every purpose you can possibly think of!